Philippe Stark is awesome for so many slick, modern, stylish reasons, but anyone who can blend my loves for interior design and guns into one classy magical creation is a true genius. 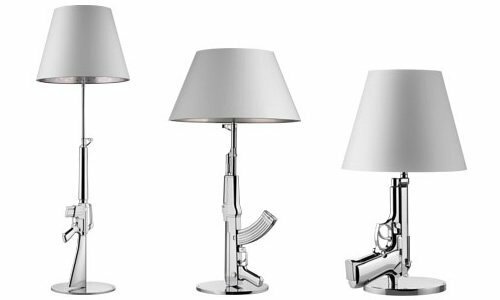 Personally, I'm leaning towards the handgun table lamp. Or the rifle. Or ... the ... um, all of them. These Chrome Gun Lamps by Philippe Stark, available from Plunder Guide, are not cheap, but then, awesome rarely ever is. I'm sooo going broke.